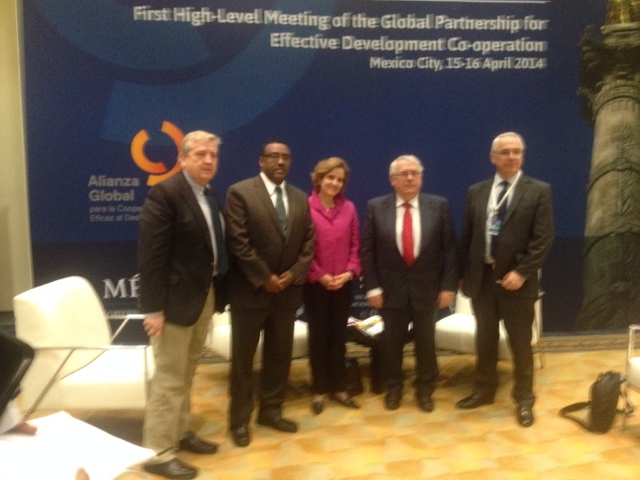 April 219, 2014 - Deputy Prime Minister Demeke Mekonnen attended the Global Partnership Conference held on 15 and 16 April, 2014 in Mexico City. The conference, which attracted more than 1,500 high ranking Ministers and experts was the first high �level meeting since the holding of the conference in Busan,South Korea in 2012. In the opening plenary panel hosted by the renowned BBC journalist Zeinab Badawi, Mr.Demeke briefed the participants that the Ethiopian government has played its major role in making foreign aid effective based on the core principles of country ownership, mutual accountability and results. He further said that the key players in this endeavor are the government, private sector and the civil society and due to these well coordinated efforts and a clear vision and strategy of the Ethiopian government, Ethiopia�s economy has registered a double digit growth for the last 10 years. Mr. Demeke also participated in another focus session that looked into aid effectiveness and results. Mr.Demeke briefed the participants that Ethiopia has a clear vision and strategy to become a middle income country by 2025 and to achieve this, the government has set out a five year Growth and Transformation Plan of its own and still is registering an uninterrupted double digit economic growth. He further said that Ethiopia has allocated a major portion of its budget for education, health and food security and these pro-poor policies have started to produce the intended results in alleviating poverty in Ethiopia. Mr.Demeke added that the Ethiopian government has been working closely with donor countries based on country ownership, shared values, joint planning, clear harmonization and joint monitoring. On the sidelines of the high level conference Mr.Demeke held bilateral meetings with German Parliamentary State Secretary and also with Ministers for International Development of Ireland and Denmark. He also discussed with the CEO of the Global Partnership for Education(GPE) on achievements and future government plans of expanding education in Ethiopia. The partnership, created in Busan, South Korea aims to bring together aid donors and recipients, emerging economies, civil society organizations, private sector companies and foundations in the hope of eradicating poverty through better cooperation. It is based on five principles intended to make aid more effective: ownership; alignment; harmonization; mutual accountability; and results. Central to its philosophy is the concept of ownership: letting developing countries set their own strategies for poverty reduction, improving their institutions and tackling corruption.